BAFTE: Infringing on our rights again? Is our federal government at it again or better said; are they still trying to find new and interesting ways to take away our rights. 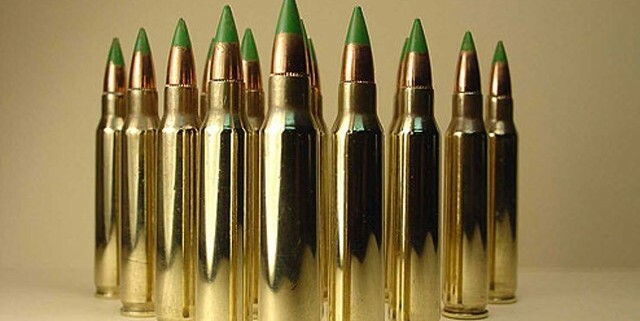 In specific, is the ATF currently looking at reasons to ban M855/SS109 ammunition in regards to protecting LEOs. Is said ammunition, that can penetrate level 2A body armor when fired from a pistol so completely evil that they want to take it away from us or… are they creating a NEW supply and demand for money? I completely agree that LEOs should be protected, but being an LEO is inherently dangerous and just comes with the job. Are they trying to further restrict and infringe on our rights? I have no doubt that is a definite possibility, but I’m more likely to believe that they are creating a “money” scheme here. So let me explain this little scenario. Many of you (hunters) in particular might be saying; “what’s this got to do with me? I have absolutely no need for “armor piercing” ammunition.” Well let me say this about that. They are postulating that with the advent of handguns that can fire rifle caliber ammunition such as the FN Five-seven and other hand-held AR-15 pistol/stock configurations that they now need to limit “our” access to this dangerous level 2A body armor piercing ammunition. Now I know most hunters could care less about handguns that can fire “armor piercing” rounds, but understand this; it’s not about what you DON’T need, it’s about what they CAN take away from you. What’s next? 30-30, 30.06? Remington or Thompson competition or hunting handguns? What about ALL those hunting rifles you are carrying whose ammunition can penetrate level 2A body armor? Let’s have a quick history lesson and I’ll explain (in my opinion) what’s truly going on. The Gun Control Act of 1968 (GCA), as amended, 18 U.S.C. Chapter 44 prohibits the import, manufacture, and distribution of “armor piercing ammunition” as defined by the statute, but there is an exemption that allows the Attorney General to determine if that specific ammunition is primarily intended for sporting purposes as it has been for a very long time, until now. Originally the provisions defining and governing these so-called “cop killer” rounds were enacted within the Law Enforcement Officers Protection Act of 1986 (LEOPA), but when LEOPA was finally passed by Congress in 1986, the final bill focused on two specific definitions; composition of the ammunition and whether it can be fired from a handgun, and size, jacket weight as well as design and intent. This created a huge loophole in the original intent of LEOPA, by expanding the definition of armor piercing ammunition to include any ammunition containing a specified metal content and that it can be fired from a handgun. Viola. Eric Holder defers his responsibilities to define and rule as Attorney General as was always intended, to the BATFE Director and now they can propose the change, rule on the change and completely ban this ammunition without Congress’ approval. So now we have the HOW they can do it, but some might still be unclear as to the why? It’s coming, but bear with me a bit longer as I wade through a few more defining actions and reasons I believe make this scenario a money making scheme. The FN Five-Seven has been on the civilian market for over 10 years, and all of those years the Brady Campaign has been working to ban it. U.S. Rep. Eliot Engel (D-NY of course) even wrote three separate bills that were introduced to the Senate and all three times the bill failed to proceed to a vote. They could NOT find reason to even entertain the thought of why it should be even voted on, let alone banned. Then add in all the new AR pistols to hit the market recently and we have the “gun control” nuts freaking out, using LEOPA as a battle flag and doing it without even realizing what they are creating. If we add to that everything we know about Level 2A body armor, and that there hasn’t been any significant studies to prove that deaths occur more frequently from penetration versus blunt force trauma. Yes, blunt force trauma is a much more common injury to occur when shot while wearing body armor. And we also know that almost every modern sporting rifle will penetrate even level 3 body armor. So who exactly does the government intend to protect by banning this evil, malicious cop killing ammunition? I’m interested in that answer, but I know what the politicians would say and it stinks like a fresh cow pie. LEOs, of course. Does our government want a chance to infringe on our rights? Again, of course they do, and we can see just how destructive this current administration has been toward our 2nd Amendment rights simply by looking at how many times the BATFE (ATF) has ruled and restricted our firearms regulations throughout the years. Here are a few facts that kind of lay out what this administration has accomplished. From 1969 to current the BATFE has had 52 rulings entered into the books in regards to firearms restrictions. Now that doesn’t seem like a whole lot in 37 years (although in my book, any restriction is too many) but here’s the kicker, 21 of those rulings have been since 2008. You read that right. There were 31 rulings in the first 37 years, and 21 rulings in the last 7 years. Do you think Obama is doing a good job trying to destroy the 2nd? So what about this “smoke & mirrors” money scheme I was talking about? Well, if we do the research and math, we know that the government is going to be holding a very large stockpile of “armor piercing” ammunition very soon (conflicts abroad are winding down and we all know that) and no corporation would “ban” a product that you are holding a large amount of, that just wouldn’t make good fiscal sense (if you noticed the word “corporation” then good for you, because yes, our government is nothing more than exactly that). What better way to leverage that product and drive prices higher, than to release information that implies an impending shortage? Then once everyone and their brother has “run” and wiped out every store shelf in town, because they’re worried it’ll be gone tomorrow, who’s left with the biggest supply? You guessed it… Big Brother Army/Navy surplus. Now trust me, I’m not telling you to NOT run out and buy more ammunition, God knows there’s no such thing as too much ammunition. And I am certainly not telling you to NOT be concerned, we can see just how much the Obama Administration has done in regards to our 2nd Amendment rights. What I am saying is; “Don’t be surprised if this little scare doesn’t just “go away” in a few weeks/months and the prices “skyrocket” to absurd heights. So what can we do about it all? It’s just like everything else that happens within our governmental “dog and pony” show, if you don’t stand up and question them, they will assume you don’t care and rule without your consent. So let’s all get involved and bombard them with questions regarding this injustice. Below is all the contact information you need to make an impactive statement. Write it up in your own words being as professional as possible (remember, although we all might be mad and frustrated for all this asinine bullsh*t, you will still attract more bees with honey). Give them logical talking points, use facts and make concise statements. And it doesn’t hurt to let them know that WE the PEOPLE are watching their every move. So let’s “blow it up” (their phone lines that is) and let them know that NO matter what reasons they are even contemplating this action, We are not happy. Having worked as a firefighter/EMT for several services throughout the years, he has also worked as a custom metal fabricator, certified personal trainer and chef. Growing up in the rural suburbs of Detroit, it was during his frequent trips to Northern Michigan where he learned of his love for hunting and fishing. Spending several of his adult years in upstate South Carolina, his love of extreme sports took root in the foothills of the Great Smokey Mountains as he learned to rock climb and kayak. https://www.freedomfightersfoundation.org/wp-content/uploads/2015/02/greentip.jpg 336 640 Freedom /wp-content/uploads/2015/06/ff-logo-flag-340x92-300x81.png Freedom2015-02-23 09:45:032015-02-23 09:51:02BAFTE: Infringing on our rights again?